It is quite rare for me to be against any kind of voting reform. After all, I started OpaVote for the primary purpose of promoting ranked-choice voting. But when it comes to the supposed reform of lowering the voting age from the current standard of age 18 to something lower, I am dead set against it. 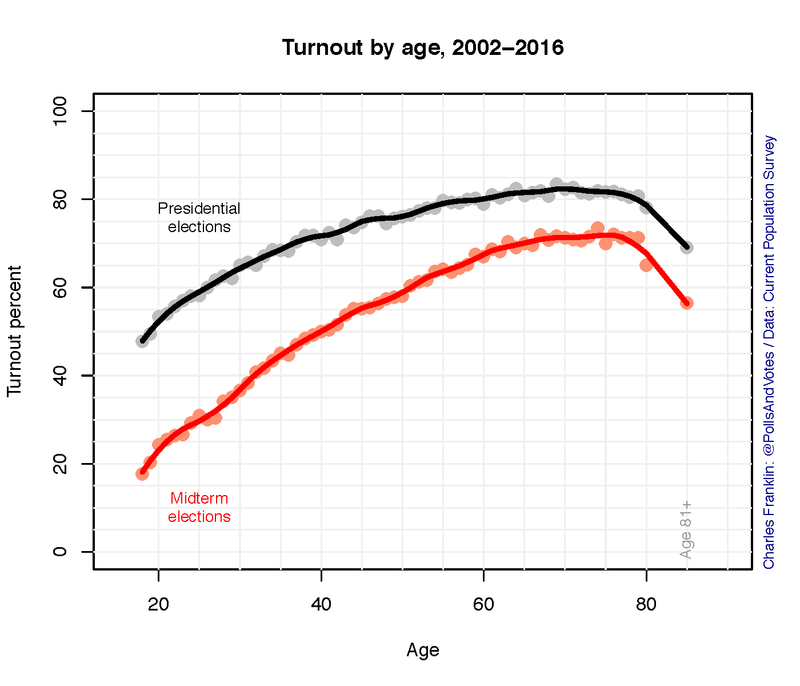 Here is my reasoning in a nutshell: I don't see lowering the voting age as having any significant impact in improving voter turnout. 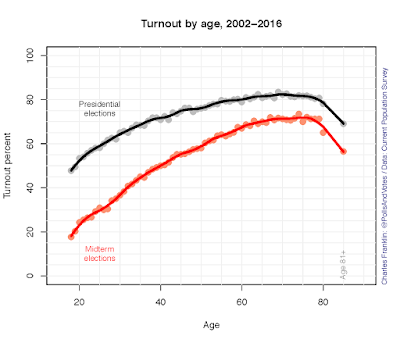 To the extent that people or organizations advocate for lowering the voting age, they are distracting us from real reforms that could make a difference. I'll limit myself to voting reforms that are focused on improving voter turnout since that seems to be the objective of advocates of lowering the voting age. Our largest election ever was completed yesterday with a total of 57,000 voters. Although we've carefully designed our online voting platform to scale to handle elections of any size, we must admit that we do get a little nervous when a customer has an election that goes where no election has gone before! One amazing aspect of modern cloud computing is the ability to quickly scale the number of servers running your website behind the scenes. For typical daily usage of OpaVote, we have a relatively small number of servers, but when a large election starts, the number of servers will increase quickly to handle the sudden increase in traffic. When the traffic slows down, the number of servers will decrease so that we are not paying for computing power that we don't need. The graph here shows the change in the number of servers when the election with 57,000 voters started. We are happy to report that the election with 57,000 voters went off flawlessly. A few months ago, we stopped PayPal support to make it easier to make payments to OpaVote for your online elections. We are happy to now announce those improvements! We process our payments using a company called Stripe, which provides amazing services and is one of those unicorn companies that you hear about. When you provide your credit card number at OpaVote, we never see it. It goes directly from your browser to Stripe, and then Stripe processes it for us. Processing credit card numbers is serious business so we let Stripe handle that for us. You can now save your credit card info so that you don't need to enter it for each payment. For those of you running many elections, this will save you the trouble of having to repeatedly enter your credit card info. Some single transferable vote (STV) elections use what is called above-the-line (ATL) voting or a group voting ticket. ATL voting is most common in Australia where STV elections sometimes have a large number of candidates and voters are required to rank a certain number of candidates in order to cast a valid ballot. To reduce the burden on voters, the voters have an option to allow their favorite party to choose the rankings for them. This post explains how you can implement an ATL online election with OpaVote. 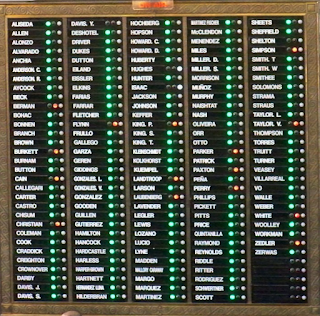 Above, is an example of a ballot that includes an ATL option. The thick black horizontal line there is the "line" of above the line. A voter can vote above the line (ATL) or below the line (BTL) but not both (I suppose some implementations may allow both but I'll skip that to simplify the discussion). An ATL vote is to select a party of the four parties competing in the election. If a voter picks a party, then the voter's vote is determined by the party's "ticket". Before the election, each party specifies its ticket, which corresponds to a ranking of the candidates competing in the election. Each party presumably ranks it own candidates the highest and followed by candidates of ideologically similar parties. A BTL vote allows the voter to rank the candidates any way he or she wants. For most elections, the anonymity of the vote is extremely important, and OpaVote makes sure that no one (not even us!) can figure out how a voter votes. 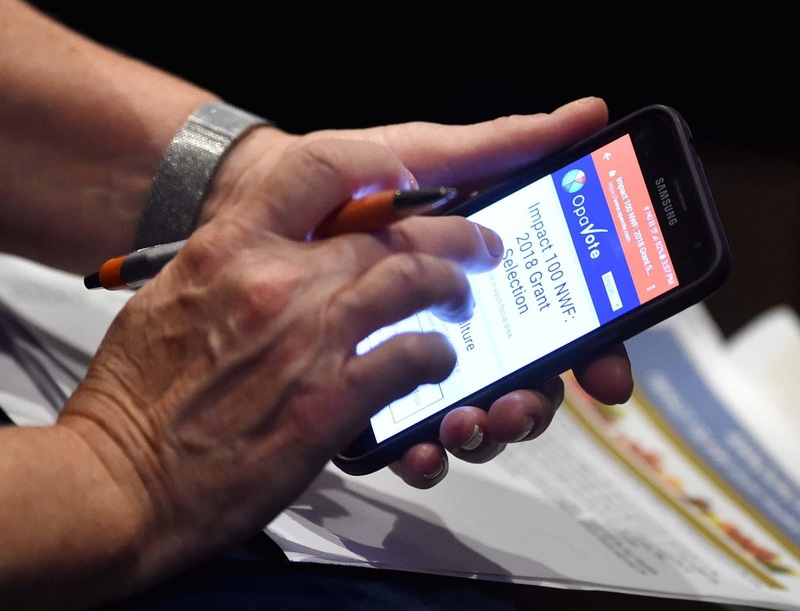 For some elections, however, it is required that the vote not be anonymous or that the votes of voters are recorded so it is known how each voter voted. Recorded votes are commonly used for elections of elected bodies. For example, for most countries, the votes of elected representatives (e.g., Senators and members of the House of Representatives) are recorded so that the people who voted for them know what they are doing. Any organization that elects people to represent its members might want to use recorded voting. For example, if you live in a condominium association and elect trustees to represent the condo owners, then you likely want to use recorded voting when the trustees vote on behalf the condo owners (though you would probably use anonymous voting when the condo owners elect the trustees). Running an election with recorded voting with OpaVote is very simple. 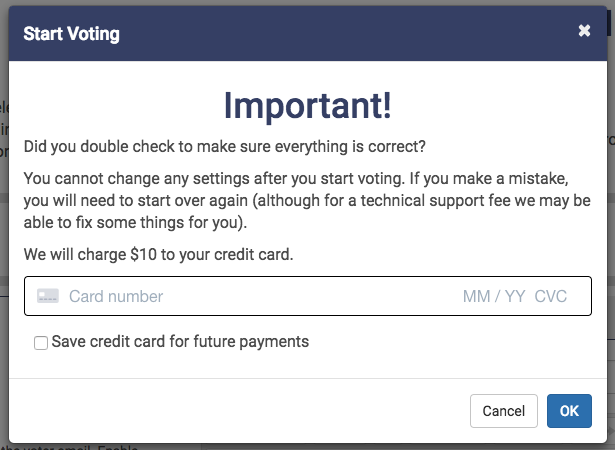 There is a new option (only available in expert mode) that allows you to set "Anonymous voting" to "no". When you do this, we record the votes of each voter. To see the recorded votes after the election is over, download the spreadsheet of all voter statistics from the election console. A new column is added for each contest in the election, and the new columns show the votes for each voter. 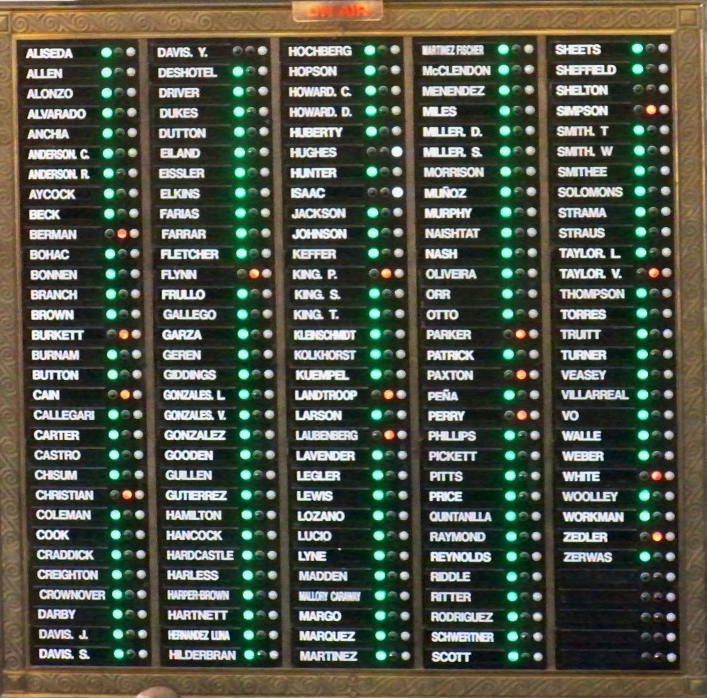 The recorded votes only available to the election manager. The manager can, of course, share the voter statistics spreadsheet with others to let them know how the voters voted.